In January of 2013, Beatrice and I did a Cabo trip. Though we’d been to Mexico a few times, this was the first to the tip of Baja. I had zero intention of buying into a timeshare; but, I was already an experienced vacation rental owner, owing to a single property—our vacation home in the Sierras—that had become so popular that it was rented almost year round and I made 3-4 times as much as renting it conventionally would have. Of course, this requires a desirable place people want to vacation at. But my [eventual] friend Scott got me. He began with his standard pitch and I kept saying no. Once he realized I was running numbers in my head, knowing they wouldn’t work without even having to get out a napkin, he began dealing with me as a vacation rental entrepreneur. They have an app for that. Several iterations later, I was calculating on the back of a napkin (literally), and he had provided a calculator, and we were in business for 10 weeks per year over about 10 years (100 weeks to sell). The capital investment was about $50K, 20K of that down and the rest financed. By April, I was making bookings via VRBO. It worked so well that by February of 2014, I doubled down and bought another contract, upping my availability to 20 weeks per year (now 200 weeks to sell over 10 years). And, that worked so well that by February of 2015, I tripled down with a third contact, upping my availability to 30 weeks per year. To date, I have done 154 bookings for a gross of $377K. However, many of those are for 3-4 night stays at a nightly rate that’s about 30-50% less than your average Expedia deal. Those bookings don’t go against my 30 weeks per year under contract, just a fringe benefit. So that’s my nutshell story about a serendipitous business opportunity I grabbed over the sipping of Pina Coladas on the 11th floor balcony of this resort. Here’s the gist of how to book here, which is just my canned blurb that goes out. 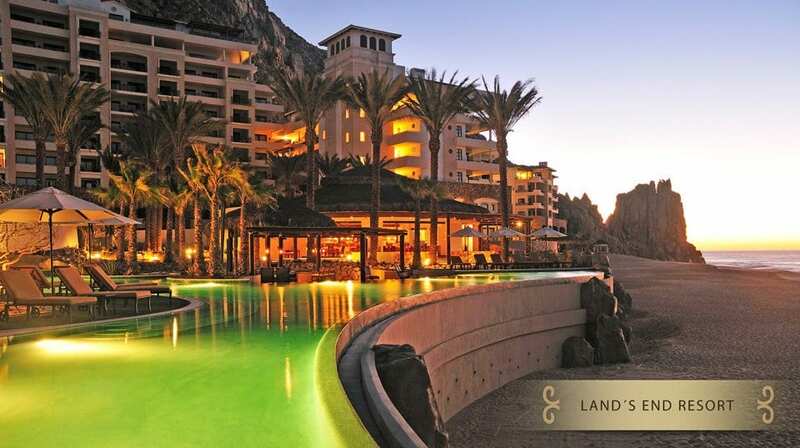 Thank you for your interest in Grand Solmar Land’s End Resort & Spa. I have 30 weeks per year of either the 1BR Master Suite (1,250 sf) or the Grand Studio (740 sf) available from January through mid-December of each year. You can see all about the resorts at their website: grandsolmarresort. *** SPECIAL 3-NIGHT STUDIO DEAL. ANY SATURDAY, SUNDAY, and MONDAY…or MONDAY, TUESDAY, AND WEDNESDAY NIGHTS THROUGH THE REST OF 2018 for $825 total. Both unit types are all luxurious: full kitchen, balcony, all ocean views, WiFi included, twice daily housekeeping, and room service for food and drinks. Guests can request preferred room location (low floor, high floor, morning sun, afternoon sun, etc.). Both unit types accommodate up to 4 guests and the 1BR and Studio can also be rented together with a “lockoff” door between them, accommodating up to 8 guests total. Since this new resort opened in 2013, I have done over 150 bookings into the property. I primarily rent 7-night stays. I can book stays of 1-6 nights, but those are at a discounted owner rate set by the resort that’s roughly 30%-50% less than the resort or hotel booking sites charge directly to the public. BUT it’s still way more than the average nightly cost for my 7-night bookings, for which I exclusively control price. For stays of 3-5 nights, rates change per the resort, please inquire. 5-6 nights are usually more economical at the 7-night rate that I control, even when not all nights are used. Note that I have no nightly rates set on my listings, only the 7-night rate, so what the listing site “quote” is an average. The 7-night rate is accurate. I have still have 7 of 30 weeks available through mid-December 2018, and have started to book for 2019 dates. I also have two 3-night slots in the Studio and one 3-night slot in the 1BR available at deep discounts where I’ve already sold 4 nights for the week. Inquire for a 3-night getaway for Cabo. Lastly, I’ll emphasize the deals I offer. Let’s use Hotels.com. These are screen shots. For a 7-night stay in Feb 2019 at Grand Solmar Land’s End Resort & Spa, this is what it would cost for the two unit types I have. $4,030 for the 740sf Studio and $5,240 for the 1,240sf 1BR Suite. My prices for EXACTLY the same (I have open occupancy, so not a particular unit…but they are appointed identically) are $1,950 and $2,450, respectively, zero taxes or other fees (owner loophole for taxes). Perhaps that’s why I’ve done those 154 bookings for $377,000 gross over the last five years. …To contact me, just drop a comment using your real email address. Nobody else will see it and I don’t span. You can also drop an inquiry on VRBO on either listing: Listing 464600 for the 1BR, or, listing 4272256 for the Studio. I marvel there are people who like sunny, hot weather. Is it October yet? Sweet lord, Martin Berkhan’s book is out. I would love to see you review it but can also understand why you could not be bothered. Financed through Solmar itself. Rate is high at 10% but, it’s simply a cost on the P&L. Grand Solmar is sold out, though they likely have reverted contracts that defaulted from time to time. The property they’re selling now is Rancho San Lucas. My Solmar contracts give me rights to book there so maybe the reverse is true. Happy to put you in touch with Scott if you like. I was behind on reading your blog and this post caught my eye. I’m a Berkeley based RE investor and am starting to expand to buy and holds/short term rentals (usually do fix and flip). I would be very interested in getting the contact info for Scott and seeing if there are still any deals around. Thank you and thanks for all the great content over the years.